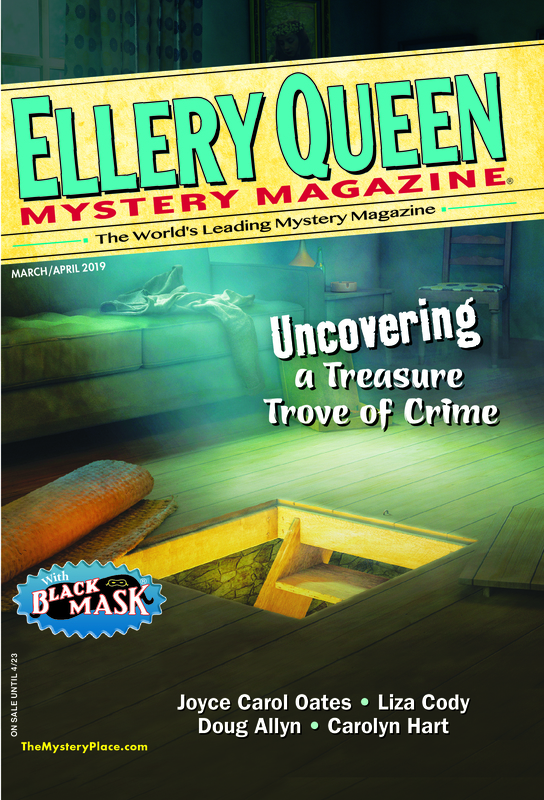 I always brag that I received my first subscription to Ellery Queen’s Mystery Magazine from a generous aunt when I was fourteen years old. And so I have enjoyed every issue over the many (MANY!) years since. It was the absolute perfect gift for a young girl who loved to read mysteries and eventually my love of reading mystery stories led to my desire to write them. So with many starts and stops I began writing. First, a novel that was never published and then a short story followed by another and another and eventually, the stories were published here and there. Finally I bit the bullet and submitted a story to Ellery Queen’s Mystery Magazine. The story was “Fontaine House” and it was published in the August 2012 issue. I love the variety of the stories I read in every issue of EQMM, so it is not surprising that the short stories I write wander all over the mystery genre: a paranormal mystery here, a noir tale there, a revenge tale or two. And there were a number of folks who were insistent that the Read ’Em and Eat series deserved a prequel short story. Now on the face of it, that sounded like a genius idea. I love writing short stories. BUT, in all my short stories I have never used the same characters in more than one story. I have found characters I loved, gave them the best story I could think of and then I left them in that story forever. With a prequel I was trying to write a short story with characters I actually knew; characters who were familiar. I am still fascinated that it was such a struggle for me to write the story that ultimately became “A Killing at the Beausoleil.” I do realize that in my short fiction I love discovering how a character is going to respond to a situation because I never met her before. But I had already written two novels with the same protagonist and sidekick; I knew their personalities and probable responses and that changed the dynamic of writing the story. Still, I admit, I have always envied the short-story writers among us who can write a series of stories using the same main characters. Our beloved Ed Hoch charmed us with story after story about his series characters: Nick Velvet, Captain Leopold, Ben Snow, Michael Vlado and many others including my very favorite Dr. Sam Hawthorne. Perhaps now that I have used repeat characters in one short story, I can do it again. Hmm, I wonder who I’d like to revisit next. This entry was posted in Books, Characters, Fiction, Guest, Story, Writers, Writing and tagged characters, cozy, crime, mystery, series, setting, short fiction, story, suspense, terrie moran, thriller, writers, writing. Bookmark the permalink. Good morning everyone. I am delighted to be here talking about a problem that may be unique to me. I would love to here about other writers experiences in using the same characters in multiple series. What say ye? Wonderful article! I grew up reading EQMM too. I remember Nick Velvet well, and looking forward to more from you. Hi Eleanor, you are very sweet. Nick Velvet was something, wasn’t he? Terrie, you can be proud you DID write a short story with your novel series characters and got it published. I’ve done three stories involving series characters, and I’ve never liked them enough to even submit them anywhere. I keep promising myself I’ll go back and fix them, but I never do. Good luck with the next one! Hi Jan, thank you for the encouragement. It’s great to establish characters for a readership that you carry over from novels to short stories and vice versa. Congrats on both your success with short fiction and mystery novels! Hi Jacqueline, You are very kind. I agree it is great to establish characters that go back and forth but it is hard. Thanks for your kind words. Keep at it, Terrie! I’ve used my series novel characters in short fiction and made a great discovery: it’s a lot of fun. I get to revisit my old pals and see what they’ve been up to, and there’s nothing better than that for a writer. Thanks for this great piece, loved reading it. I know Jeff. We all did. Hi Jeff, as did we all. Great post, Terrie! And loved your story, as you know. Looking forward to more! Terrie, I enjoy your short stories, keep ‘em coming. In answer to your question, since I have five series in AHMM, those characters of mine pretty much stay in my head clamoring to be in just ONE more adventure, ONE more story. This makes it easier for me to continue on with the same criminal protagonists, some serious and some bumbling (depending upon the particular series), as they try to survive in a rough world of other criminals. I agree, keep ’em coming. I always enjoy your stories. Thanks so much–and it was lovely to finally meet you at Bcon.